Fast Food News: Will lottery winner endorse fast food fish? Will lottery winner endorse fast food fish? The as yet unidentified winner of the record-sized Powerball lottery has been offered an endorsement deal by fast food fish chain Long John Silver's. 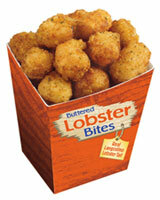 Long John Silver's is offering to make the new lottery winner a spokesperson for their new Buttered Lobster Bites: 'bite-sized pieces of langostino lobster prepared in a buttery breading.' LJS says, "Our customers tell us they crave the taste of lobster, but they don't want to spend $20 to get it." A portable snack box of the Lobster Bites is $2.99. Wow, who needs a lottery winner, when you've got me blogging like a spokesperson myself... and that's the point, isn't it. Long John's doesn't expect someone who just won $365 million to care about the money they'd get as a spokesperson, they just want the news coverage. Doh! That's what I just gave them! didn't that tex mex chain get in trouble for calling langistino crawfish/shrimp lobster when even the company who catches & sells it - says - it's not lobster? I don't know where you are getting that but Langistino is small lobster cut into pieces and prepared. Langostino are closer related to a hermit crab than a lobster. Despite the similar name, they are not langoustes - aka The Spiny Lobster or Rock Lobster. Check out this info at Wikipedia...It talks about the water bugs themselves, the FDA, and Long John's controversy.